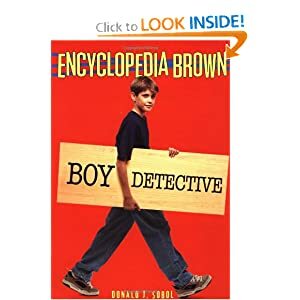 The Encyclopedia Brown books are all about Leroy Brown, the child sleuth that everyone called Encyclopedia. When I was a kid I think I wanted to be him. I have always liked trivia. But I have never been all that observant. I think that is one reason why I like reading books, because I am always surprised by plots twists that most people have already figured out. I wanted to re-read one of these books because Donald Sobol, the author recently died. So I picked up the audiobook from the library and listened to most of the first book. I remembered some of the cases, but I had forgotten a lot about the dated settings. The book mentions in passing coming home from church. One of the cases involves figuring out who really owns a tent (the actual owner found it at the dump and repaired it.) Encyclopedia’s sidekick Sally is a real side kick. She would be definitely written differently today. There is an old-fashioned “everything will come out right in the end” quality to these books. They are not really that exciting as an adult. The plot clues for the mysteries are usually very obvious. So I didn’t finish the book. But they were great as a kid and I think that they will still work well for kids today. I loved reading these books. What bothered me was that I always knew the solution was right there but as 8 or 9-year-old I could rarely figure it out. I could never figure them out as a kid either. I read a lot of these as a kid and ate them up. In the last couple years, I’ve read quite a few to my older two kids (6 and 9, the last time we read one). They loved them (and I love the old-fashioned setting, by the way — oh, the things we used to be able to assume).